Residence Custodian of Colman Hall Colleen Richey. This column is devoted to highlighting staff members that play a huge role in the everyday experiences of the Lawrence community. The goal is to focus on the “Hidden Figures” of Lawrence University and their interests both within, and outside of Lawrence. Some students may have traveled off campus for reading period, but most of the staff are still here to keep the facilities open for students on campus. I have been receiving requests for interviewing Colleen Richey, residence custodian of Colman Hall. I have heard that she is always smiling and easy to talk to, and I was excited to meet her. We met in the Colman lounge and I learned many things about her and her work experience. Richey started working at Lawrence last October and has been in Colman for over a year. Richey tries to make the extra effort to remember faces and names of students and faculty who come and go from the dorm. Prior to working at Lawrence, Richey received an Associate’s Degree in Early Childhood Development at Fox Valley Technical College. She taught in a preschool program for sixteen years and taught piano lessons for over thirty years. Mostly Richey has been a stay-at-home mom for her boys. Richey loves working at Lawrence. 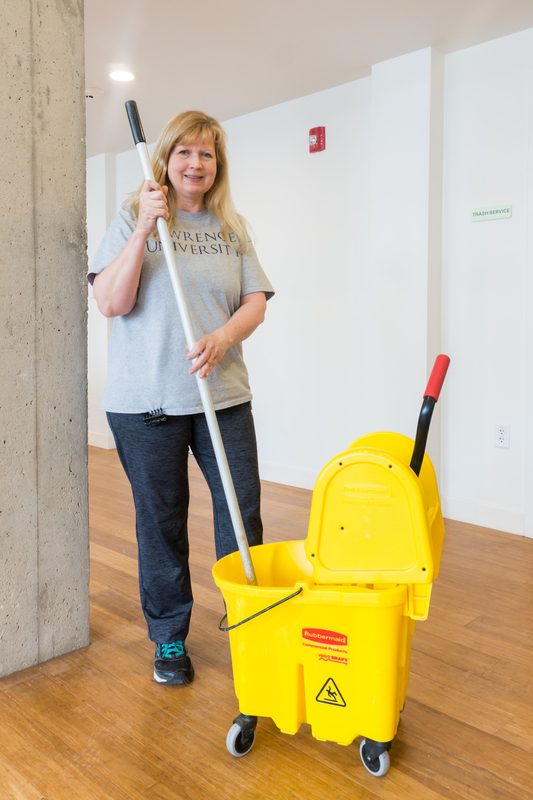 “My main responsibility is to clean the residence hall and make it nice and inviting and a place where students can feel at home,” Richey commented. The most important lesson she has learned on the job is teamwork with other custodian staff, especially in the summer when they get ready for the new school year. In addition, she works with the electricians and plumbers to put in work orders and making sure they get done right away. “The Lawrence Difference” according to Richey is a community where everyone looks out for each other. Her favorite part of her job is her daily interaction with the students. “I have met some wonderful students here who really brighten my day and are really fun to talk with,” she said. “[I enjoy] just getting to know some of them really well and what interests they have.” It is the positive attitudes of students that keep her going. In her free time, Richey loves gardening and spending quality time with her family. Her family likes doing outdoor activities together such as fishing, camping, snowshoeing and hiking. She and her husband love to travel. They are planning a trip to Europe this fall. She also shared that her and her husband are planning a trip to Chicago this week. They have been to all the museums but are looking forward to exploring new places and trying new things. Richey’s inspiration is her father “My father is 83 and has the attitude of always looking forward to life, always keeping busy and looking at the positive side of things. Even in his old age he does not give up,” she elaborated. One thing Richey would like people to know about her is that she is approachable. “I am a person who likes to talk and likes to share life,” Richey added. Richey is no doubt engaging and easy to talk to. When I spoke to her I took away the feeling that I had a conversation with a familiar, old friend. Speaking with her made my day. I realize that sometimes I forget to say “hi” to the people I walk past everyday who are working hard to make sure I feel at home, and that is something I admittedly take for granted. Richey is someone students can trust to consistently be there and be a reminder to keep moving forward. Personable, open and kind, Richey is this week’s Hidden Figure of note.